Brooklyn Black Chocolate Stout: Brewed since 1994, Brooklyn Black Chocolate Stout has dark chocolate aroma and flavor through the artful blending of six malts and three distinct mashes. Properly kept, it will improve in the bottle for many years. So, buy enough to enjoy now and enough to age for a few years. 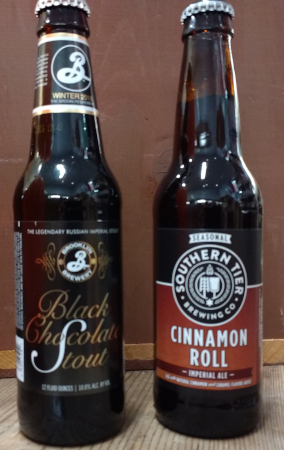 Southern Tier Cinnamon Roll: In this brew, lightly toasted malts with subtly spicy hops blend into cinnamon flavors and creamy lactose sugar. Their coalescence is so close to fresh baked cinnamon rolls that it was impossible to name this beer anything other than Cinnamon Roll Imperial Ale! Pairs perfectly with eggs benedict at brunch, after dinner, or next to the fire for an unforgettable nightcap.